As a small child, Red Széll took the childish instinct to climb things to new heights, conquering the north face of his cot when he could barely walk. Next came trees and rocks and, later, he took inspiration from mountain men Chris Bonington and Nick Estcourt, as well as Blue Peter’s John Noakes, who scaled Nelson’s Column with the help of a rickety ladder in 1977. At university in Cambridge, Széll (pronounced “sail”) Spider-manned his way over buttresses and parapets, smoking a joint on the roof of the Fitzwilliam Museum before descending under the cover of darkness. He was invincible. “The sky really did seem like the limit,” he says. Then, just as he felt like nothing could keep him down, Széll learned that he was going blind. A degenerative condition called retinitis pigmentosa was killing the rods and cones that give us vision. After learning to cage his inner rat – mostly – Széll, a Sussex man originally, settled in north London with his young family and became a writer. He is now 45. Life was fine, but the gnawing persisted, until his outlook changed dramatically one day in 2009. His eldest daughter had decided to celebrate her ninth birthday at the local climbing wall. “I left feeling my eyes had been opened to a world of new possibilities,” he says. Széll has agreed to return to the wall, at Swiss Cottage Sports Centre, to offer a demonstration and – later – a lesson in blind climbing. He also recalls how a tentative return to the sport led him, four years later, to an audacious attempt on a giant sandstone pillar in the Orkney Islands. The Old Man of Hoy rises vertically out of crashing waves, to a height of 137m (449ft). Almost three times the height of Nelson’s Column, it maintains a towering reputation among British climbers, 50 years after Bonington first scaled it. Széll always looked at it in awe as a child, but never thought he’d climb it. And after he went blind, how could he? “But I’ve never particularly liked being told what I can’t do,” he says. At the base of the climbing wall, which is a tenth of the height of the Old Man of Hoy, the noise comes not from waves but the buses chugging around the one-way system below the open-sided wall. Széll ties a rope to his harness using a figure of eight, finished with a stopper knot. Matthew Wootliff has joined us. A fellow amateur climber and former school-run acquaintance, he has become Széll’s eyes. He starts by placing his friend’s hands on the first holds. Then, talking to him via an earpiece and radio headset, he watches his instinctive moves, and uses a clockface system, developed over months, to guide his limbs. “Left hand 11… right foot 5.30… right hand out… 2 o’clock… no… up a bit, up. Yep.” Apart from the occasional, plane-like circling before his hand lands on a hold, Széll climbs with remarkable fluidity, soon hitting the metal roof to announce his arrival. At the other end of the rope stands the third member of Team Széll. Andres Cervantes is a softly-spoken Colombian PhD student and was one of the instructors at the Swiss Cottage wall who agreed, without hesitation, to help a blind man summit Hoy. 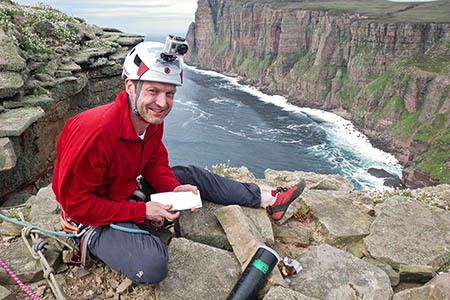 Széll tells the story in his new book, The Blind Man of Hoy, with a foreword by Bonington. In 2013, after months of gruelling training and preparation, and periods of frustrated cursing, the trio made the journey to the Orkneys and – spoiler alert – they all made it to the top. Széll is, as far as anyone knows, the only blind person to have achieved the feat. After a shake of my forearms, I put on a blindfold for another go. Cervantes places my hands on the first holds, and talks me through the first few moves using the clock technique. It’s disorienting, but the pain comes with the extra time it takes to locate each hold. While I flounder with one arm, the other one trembles under the strain. I also lose a sense of place, so that when I inevitably fall off, and swing on the rope like an ungainly fish on a hook, it’s only when I pull off my blindfold that I see I’m only three metres off the ground. Blind climbing is about as easy as it sounds. Széll, who has one other book to his name (Blind Trust is a crime novel with a blind protagonist), is now working on a sequel, while also looking for a second big challenge. There’s talk of a new climb, perhaps in the Alps, and a tandem cycle ride with Wootliff. Does his daughter, who inadvertently inspired this new life, still climb? “She gets the heebie-jeebies at about seven metres but the younger one, Megan, is a better climber than me,” he says, his face stretching into a smile that beams with pride.